I fiddled with this pattern big time and wanted to detail all my changes and process. I used the 32DDD as a base, and added 2.75" to the band piece (for a total of 5.5" in band circumference). I also split the lower cup and added 0.25" to each side of the split (0.5" total). 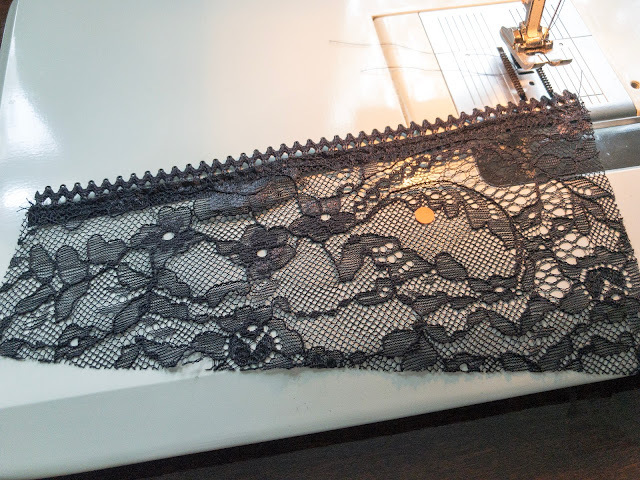 My lace isn't galloon (the stuff with the nice border), it's yardage, so I needed to do something to finish off the top of the cup. I added a 0.25" seam allowance to the top cup piece, and used 0.25" elastic to finish the top of the cup. The reason I added the 0.25" seam allowance was because that was what I would lose in attaching and folding down the elastic. I applied the elastic by laying the top cup piece and elastic both right side up, and zigzagging down the top edge. I then turned the elastic to the wrong side and zigzagged it in place. Dammnnn this looks great for very little effort! My zigzag was set at 2.0mm long and 2.5mm wide on my machine and I think it looks good. 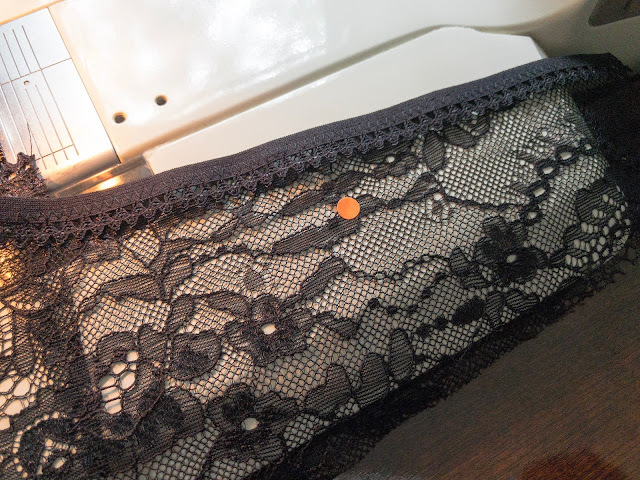 You may be wondering what the orange sticker dots are all about...I use them to denote the 'right side' of the fabric.